If you've ever been unpleasantly awakened by a ray of sunshine streaming onto your face, install window blinds over your windows and control the amount of sunlight that enters the room. Window blinds consist of a number of slats. Angle these slats up or down to direct the sunlight. When you don't want anything covering the window, pull the slats up out of the way. Window blinds are easy to use and they do not vary much from one manufacturer to another. 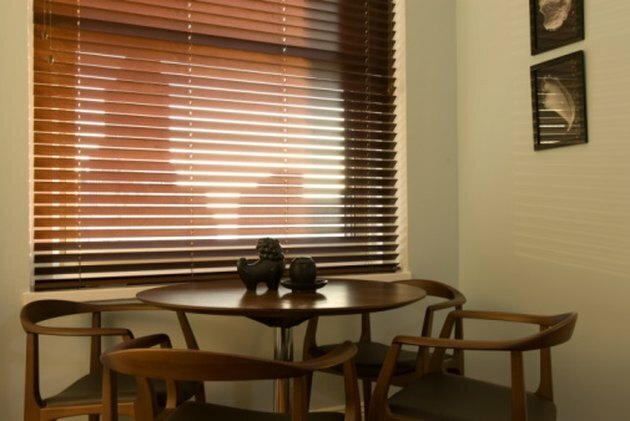 Blinds control light and offer privacy. Raise the blinds by pulling the cord down. Pull the cord slightly to the right to lock the blinds in place. Lock blinds in place at whichever height is best for you. If you want the blinds to be only half down, pull the cord until the blinds reach your desired height then pull the cord to the right to lock them in place. Unlock the cord by pulling it towards the left. Once the cord is unlocked, you can raise or lower the blinds to a different height. Pull both cords at the same time to raise and lower the blinds evenly. Pulling one cord more than the other results in the blind's bottom edge becoming crooked. Even them out again by pulling on the cords separately until the bottom edge runs straight across the window. Adjust the angle of the slats by twisting the rod. Rotating the rod clockwise angles the slats down while turning the rod counter clockwise angles the slats up. When the slats are angled down, the sun shines towards the floor. Slats angled up send the light towards the ceiling.